Hollerbach dressed and ran out of the house to find a policeman. As he passed the tanyard he could hear a voice he recognized as Herman Schilling’s calling for the watchman and yelling “murder.” Unable to find a policeman and probably too frightened to do anything else he returned to his home. Sounds of activity were still coming from the tanyard but the screaming had ceased. Soon all was silent. Hollerbach kept watch the rest of the night but did not see Schilling leave the tanyard. At 7 AM, Cornelius Westenbrook, one of the tannery workers arrived at the tanyard and called for Herman Schilling. Hollerback ran over and told his story, saying he believed that Herman Schilling had been murdered. Westenbrook sent his son to notify the police and to alert Henry F. Frieberg, owner of the tannery. In the yard near the stable they saw signs of a scuffle and found two possible weapons, a long pole sharpened at the end and a five-pronged pitchfork Both had fresh traces of blood and on one prong of the pitchfork was a suspender buckle. The police searched the small room above the tanyard where Schilling slept but found no evidence that he had been there that night. If he had been murdered, they wondered what had become of Schilling’s body. Someone suggested it might have been put in the furnace. The tannery had a furnace that was used to boil water, it was large and was capable of generating extreme heat. Opening the furnace door, one of the police officers thought he saw a bone but the fire was still blazing and the heat too intense to look closely. They doused the flames and with an iron hook extracted bones and charred human flesh. In the ashes, they also found a suspender buckle that matched the one on the pitchfork. 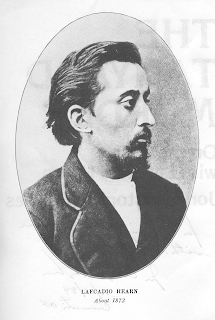 Lafcadio Hearn, who was fast earning a reputation as Cincinnati’s finest reporter, had come to the city from Dublin in 1869 at age 19. He was born in the Greek island of Santa Maura, his mother was a native of the island and his father a surgeon in the British army. He was raised by an aunt in Ireland and sent to America when money for his education ran out. 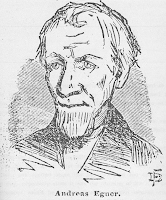 In Cincinnati he took menial jobs and wrote stories for weekly newspapers. By 1874 he was working full time for the Cincinnati Enquirer, Cincinnati’s premier daily paper, writing sensational, sometimes gruesome, stories from the city’s dark side. The tanyard murder was the story would clinch his fame. Hearn followed the case closely, accompanying the police and coroner as they questioned witnesses and interrogated suspects. The most obvious suspects were Andreas Egner and his son Frederick who had previously been arrested for beating Herman Schiller with barrel staves. They probably would have murdered him then if they hadn’t been interrupted by workmen. 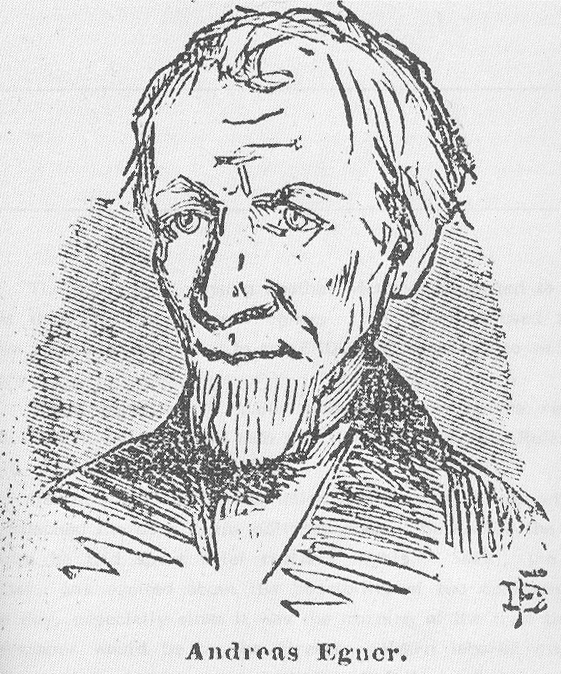 Andreas Egner owned a saloon and a boardinghouse immediately west of the tannery. The morning after the murder, the gate separating them was wide open. 25-year-old Herman Schiller, an employee of the tannery, had roomed at Egner’s boardinghouse until the night Andreas found him in bed with his fifteen year old daughter Julia. Schiller escaped through the girl’s bedroom window and never returned. When Julia subsequently became pregnant, Egner beat her and sent her out of the house. In her seventh month of pregnancy, Julia died in the hospital. Andreas Egner accused Schiller of seducing his daughter and causing her death. The Egner’s had attacked Schiller on the day of Julia’s death. A third suspect was arrested, George Rufer, who had been fired from the tannery on Saturday and, for unspecified reasons, blamed Schiller for his dismissal. Rufer’s clothes were covered with blood that he claimed came from a chicken he had killed the night before. He had scratches on his face which he could not adequately explain. In broken English and German, Rufer responded to police questioning, claiming he was nowhere near the tannery Saturday night, but that he had once heard Andreas Egner say that Schiller should be run through with a pitchfork. The suspects all claimed innocence and under hard interrogation from the police and coroner stuck to their stories. Andreas Egner would not tell his questioners anything; George Rufer told conflicting stories but always tried to shift suspicion to Egner. They had waited until Saturday, Rufer said, because his dismissal from the tannery would throw suspicion his way. 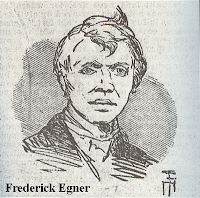 Young Frederick Egner was the most distressed by questioning and spent the night weeping and moaning in his jail cell. Andreas Egner heartily agreed and the three of them planned to meet at 9:30. They hid in the shadows of the tanyard and waited for Schiller to come up the alley. Schiller went to the stable to tend the horse and Rufer came up behind him and struck him with a heavy piece of wood. Schiller, stronger than any of them, fought back, but Andreas plunged the pitchfork into his abdomen while Rufer continued to beat him with a stick. When Schiller began to cry for help, Rufer grabbed his throat and strangled him as Andreas continued stabbing. Less than two minutes after the attack began, Schiller lay motionless on the ground. They discussed ways to hide the body and Rufer suggested stuffing him into the furnace. He tried to do it himself, but it took three of them to put him, feet first, through the furnace door. Half way in, the body got stuck in the furnace door and Rufer used an iron rod to force it all the way in. Schiller was not moving or speaking, but Frederick could not say for certain that he was dead when he went into the furnace. That night the confession was transcribed as Frederick repeated his story to the coroner. He also repeated it to George Rufer, who called it a lie; and his father, who called Frederick insane. The next day he repeated his confession on the witness stand. The coroner’s jury found that there was evidence to indict George Rufer and Andreas Egner with first degree murder and to indict Frederick Egner as an accessory. After the verdict Rufer confessed as well, but put the blame on Andreas for initiating the action and dealing the death blow. 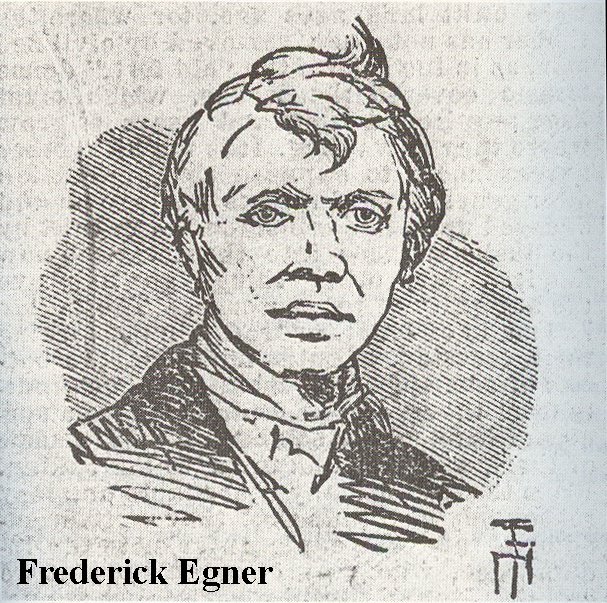 Charges against Frederick Egner were dropped. Though his father still proclaimed his innocence, he did not fight the charge. In a later trial, Andreas Egner and George Rufer were both sentenced to life in prison. During the inquest, more information came out about George Rufer. He had previously served prison time as a horse thief and had another wife and child in Louisville. His current wife, Frederika, now destitute, went mad and tried to murder their eighteen-month-old daughter by slamming her head against a trunk. 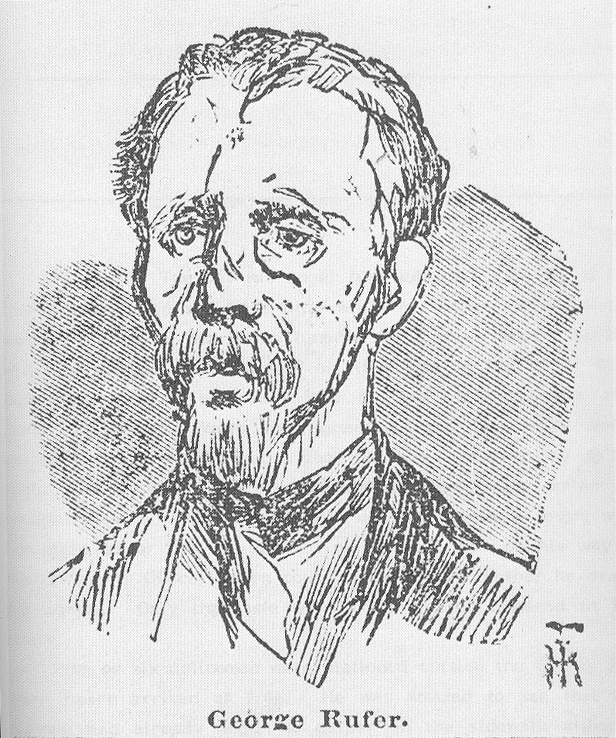 Andreas Egner contracted consumption in prison and was pardoned by the governor when it appeared that he was dying. 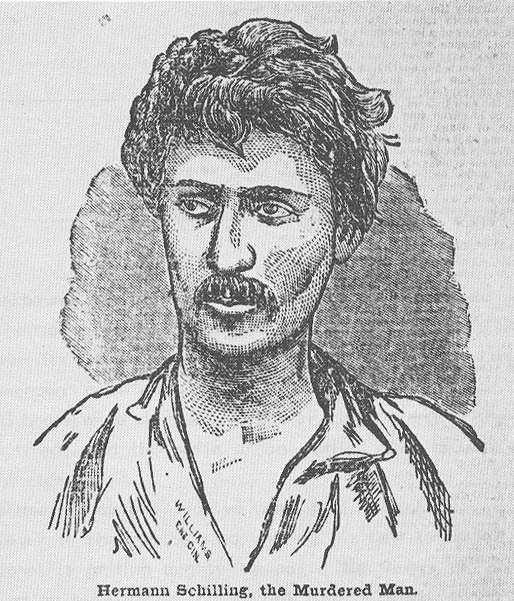 He recovered and lived several more years, but died “a raging maniac” in 1889. Lafcadio Hearn was fired from the Cincinnati Enquirer for openly cohabitating with a mullatto woman, which was against Ohio law at the time. 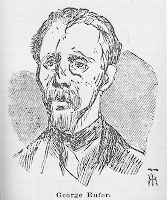 In 1877 he left Cincinnati for New Orleans where he wrote for the Commercial Item and Times Democrat. Hearn wrote a series of essays on New Orleans culture that are still read today. After a brief stop in Martinique, in 1890 Hearn went to Tokyo. He had been commissioned by Harper and Brothers to write about Japan, but a dispute with his editors left him stranded there. 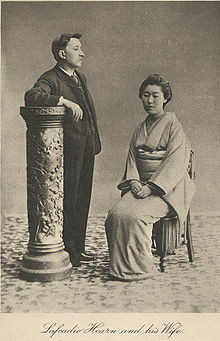 He met and married Setsuko Koizumi and in 1896 he was adopted by her parents so he could become a Japanese citizen. He continued to write about Japanese culture until his death in 1904. His ashes were buried in Tokyo after a Buddhist ceremony. Hughes, Jon Christopher. The tanyard murder: On the case with Lafcadio Hearn . Lanham, MD: University Press Of America, 1982. Hughes, Jon Christopher. Period of the Gruesome . Lanham, MD: University Press Of America, 1990. Very interesting, I never heard of this one before. Great site, thank you! I'm a native Cincinnatian. Great history lesson! A very interesting post! I live in Germany and could hear that call for help in German in my head: "Um Gottes Willen, laß(t) mich allein!" It would be very interesting to know if the original German phrase is preserved, because "laß" would mean Schilling was addressing one assailant, and "laßt" would mean he was talking to two or more. I wonder if there were any German newspapers in Cincinnati that covered the event. Ann Marie, There definitely were German language newspapers in Cincinnati at the time and they certainly would have covered this crime. It would be interesting to see how they reported it.